SaaS startups are growing faster than ever before. 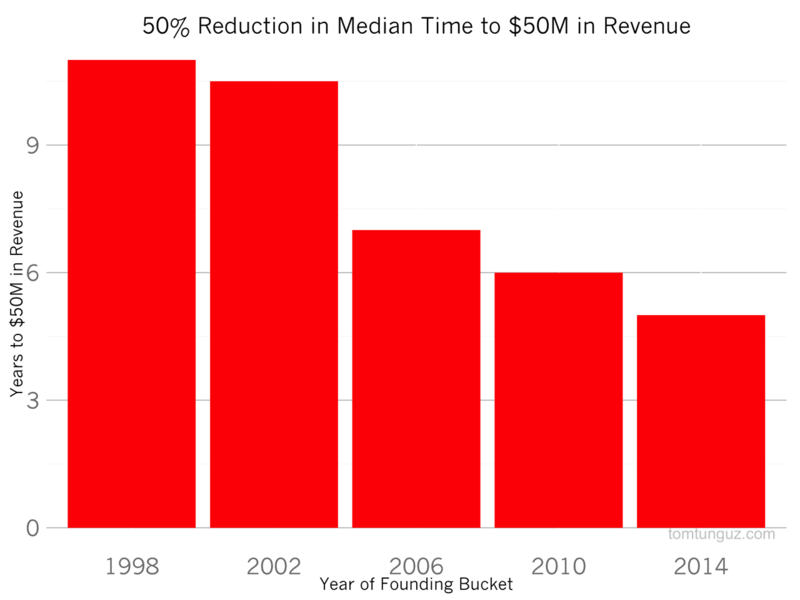 Publicly-traded SaaS companies founded from 2008 through 2014 needed 50% less time to reach $50M than their counterparts founded between 1998 and 2005. 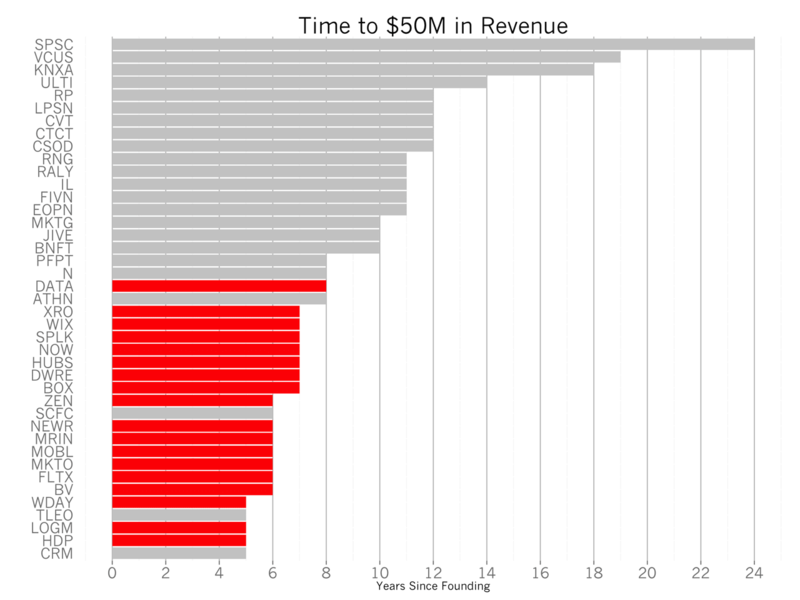 I stumbled across this trend when looking at a different chart used in my S-1 analyses that compares the time to $50M for each of the 51 or so publicly traded SaaS companies. I’ve colored the companies founded in the last ten years in red. Newer SaaS companies grow faster. 82% of the companies to achieve $50M in revenue in under 8 years have been founded in the last decade. Meanwhile, all of the companies requiring longer than 8 years were founded before 2004. SaaS companies and enterprise companies broadly are growing faster than ever before. And they are doing it every stage. This chart plots the median revenue of the basket of publicly traded companies by founding date. The curve of every subsequent cohort is steeper and the time to reach certain milestones is shorter. SaaS companies are growing faster at every step in their path. These faster revenue growth rates are the most important contributor to the increasing valuations in the fundraising market. While the increasing supply of venture dollars may enable larger cash requirements for faster growing companies to fuel their growth, the data shows that newer SaaS companies can be far more efficient growth engines than their forbears. 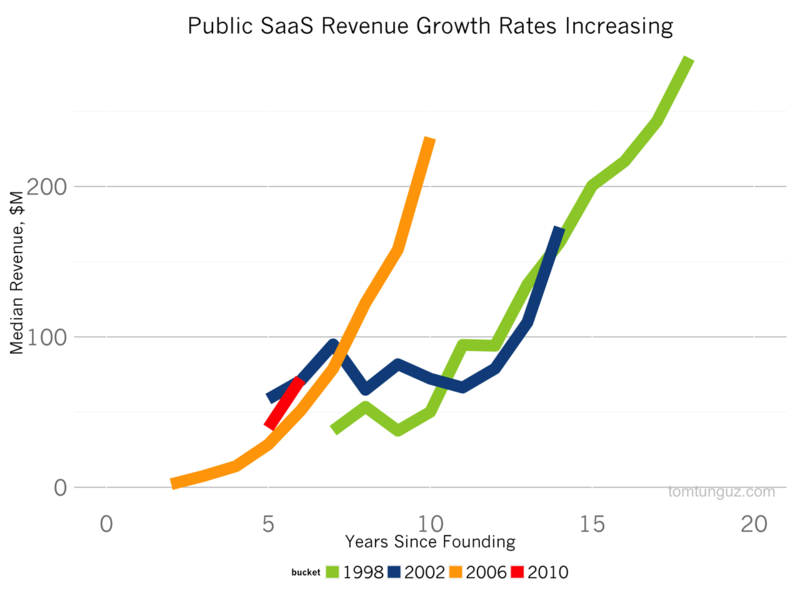 SaaS companies are growing faster and more efficiently than ever before. The new sales model of acquiring customers with B2C2B techniques by attracting end users through app stores, self sign up and open source software, combined with high velocity inside sales teams has created an enormously attractive growth engine that will catapult SaaS companies to dominate every existing category of software and many new segments yet to be created.